Properties in Rangataua average 4.5 out of 5 stars. 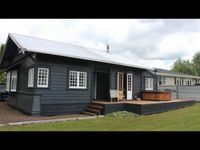 Property 3: The Dairy - Comfortable & Sunny 5 mins from Ohakune - Wifi with unlimited data. Cosy dog friendly bach - fully fenced, mountain views and fireplace. Property 16: Cosy dog friendly bach - fully fenced, mountain views and fireplace. Property 27: Inviting Railway Cottage. Old World Charm with Modern Conveniences. 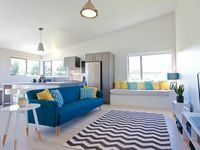 Stunning views of Ruapehu, this sunny little villa has a quaint charm with everything we needed. These best thing about this charming little villa is the unobstructed views of the mountain - we watched Ruapehu change colour from the deck in the fantastic spa, what a treat! Certainly felt like we were on holiday. The kids enjoyed the spa and the house had everything we needed. The wood burner nicely warms up the living area, but the bedrooms remained a little chilly (however there were panel heaters that we didn&rsquo;t use which might have helped with that). Overall we had a wonderful stay with fantastic weather. Property owner and caretaker was easy as to contact while we were here when we had trouble getting the spa up to temperature and everyone was super lovely. Thanks for a great stay Vicky and co. Thanks for having me and my family stay. Your place was very comfy and had everything in it you could want. The spa made for a nice relaxing end to a day of biking and also the fireplace was nice also for my wife who feels the cooler temps. Thanks again and we will definitely be back at some stage.